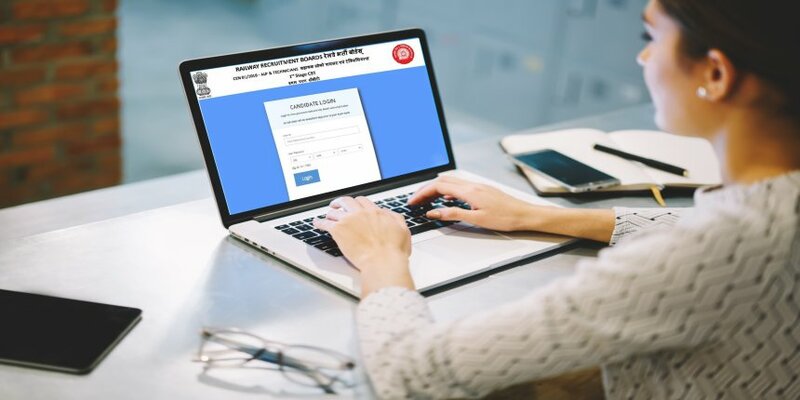 RRB ALP Admit Card 2018 – Railway Recruitment Boards (RRBs) will activate the link to download the exam city slip and travel pass for Computer Based Aptitude Test (CBAT) anytime soon. The Boards were scheduled to conduct CBAT exam on April 16. However, the test has been postponed and the revised dates will be released shortly. The Boards had released the revised 2nd stage admit card of RRB ALP on February 5, 2019 (1 pm onwards). The admit card has been released for candidates who were unable to appear for CBT 2 between January 21 and 23 due to technical issues. The exam for such candidates was held on February 8. The admit card for second stage was available from January 17, 2019, four days before the scheduled exam date. 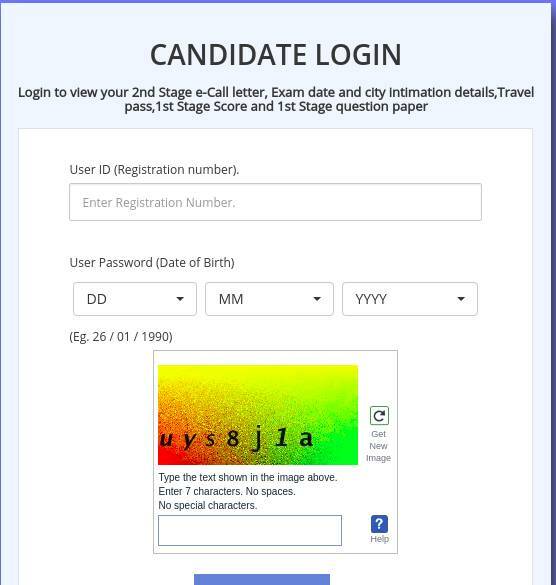 To download RRB ALP admit card, candidates have to enter user ID (registration number) and password (date of birth). No admit card is sent to candidates by post. Details like candidates name, roll number, date, time and test centre are mentioned in RRB ALP admit card. Along with the admit card, candidates need to carry one photo-identity proof for verification. Earlier, the examination authority had activated the link to check the exam city and date for RRB ALP second stage CBT. Candidates can access the link given on this page to download RRB ALP admit card 2018. Candidates can check below the dates pertaining to the release of RRB ALP admit card. Candidates need to enter user ID and password. 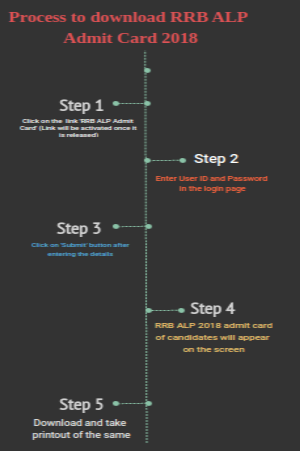 The flow chart given below indicates the steps to download RRB ALP 2018 admit card. Snapshot of RRB ALP admit card of candidate is given below. Error in RRB ALP 2018 Admit Card – What steps to follow? Candidates are advised to check the details printed in the RRB admit card. In case, there is any error in details like name, date of birth, father’s and mother’s name, photograph, and signature, candidates should immediately contact the respective RRBs for correction. Candidates can visit the offices of RRBs directly/ call/ email them. While writing an email regarding correction of details, candidates must mention clearly the details that have to be corrected. After correction, RRBs will issue fresh admit cards to candidates. The admit card of RRB ALP is divided into two parts – Candidate’s Copy and RRB Copy. The details included in both the copies are given below. What is RRB Admit Card 2018 Candidates Copy? Candidates copy contains information of candidates which have to be shown during the exam to the invigilator at the time of verification of candidature. What is RRB Admit Card 2018 RRB copy? It is an official copy which contains exam details like exam slots and dates. This copy is meant for the official purpose which will be retained by officials at the time of verification during the exam. Candidates must bring their e-admit card of RRB ALP along with a photo identity proof. An authorised person will validate the identity proof against the admit card at the examination centre. Besides photo-identity, candidates will have to carry one colour photograph of size 35mmX45mm. Identity Card issued by the employer if candidates are a government employee, School / College / University Photo ID card etc. The admit card is uploaded four days before candidates exam. The examination authority has informed candidates regarding the uploading of RRB ALP admit card through SMS and email. No admit card is sent to candidates by post. Candidates should leave the space provided in the RRB ALP admit card for writing self-declaration paragraph, signature and Left Thumb Impression (LTI) which they have to sign in front of the invigilator. RRBs does not entertain any request for any change in RRB ALP exam centres, date, and session allotted to candidates. The admit card also have the barcode. The admit card has a space for writing self-declaration paragraph along with signature and left thumb Impression. Candidates have to fill that part at the examination center in the presence of the invigilator. By writing the self-declaration candidates agree that the details filled in the application form are complete and correct. The self-declaration has to be in lowercase and not in capital letters. Candidates can check below the exam day guidelines of RRB ALP. Electronic gadgets like mobile phones, bluetooth, pen drive, laptops, calculators, wrist watches etc are not allowed inside the exam centre. Copying inside the examination hall is strictly prohibited. Any candidate found using unfair means in the examination like sending someone else in his/her place to appear will be debarred for lifetime. Q. Will I receive my admit card of RRB ALP 2018 via post? Ans. RRB ALP 2018 admit card is not sent to any candidate individually by post. Therefore, candidates have to download the admit card online only. Q. Is my RRB ALP admit card valid for all stages of the exam? Ans. No, separate admit cards are issued for the various stages of RRB ALP 2018 exam. Q. Can I change the venue of exam centre? Ans. No request for change in exam centres is accepted by examination authority. Q. I am having difficulty while trying to download RRB ALP 2018 admit card. What do I do? Ans. Candidates unable to download admit card must inform the concerned Railway Recruitment Board regarding the same before the date of exam. Ques: Problem in downloading RRB ALP admit card, What might be the reason? Ans: Candidates may be unable to download the admit card due to the various reasons like incomplete registration, slow Internet speed and incorrect credentials. Ques: What to do if I Did not receive RRB ALP Admit Card? Ans: The admit card of RRB ALP 2018 has been released for candidates who have successfully submitted their applications. 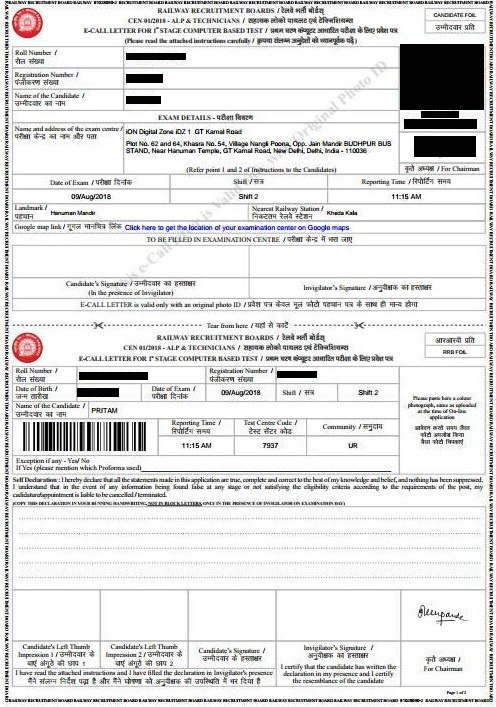 Even after receiving the registration slip (generated after successful registration) and payment acknowledgement (received after successful payment), if any candidate does not receive their admit card then they should immediately contact the RRBs with proof of having submitted their application form. Ques: What to do If I forget registration number? Ans: Candidates can retrieve their registration number by entering the date of birth, email, mobile, Aadhaar number and security code. Ques: Which web-browser should I use to download RRB ALP admit card? Ans: Candidates should try to download the admit card in web-browser like the latest version of Chrome, Firefox, Internet Explorer 8 & above. Ques: When can I check the details of the exam city, date and shifts? Ans: The link to check the exam city, date and shifts has been activated. You can check the exam city and date by entering your login credentials. Ques: What if the google map link is not working? Ans: If in case the google map link given in the admit card is not working then candidates should search the exam centre in the google maps and view its location. Ques: Will RRB issue separate admit cards to scribe? Ans: Visually Handicapped (VH) candidates can avail for scribe assistance. Separate admit cards is issued both to the candidate and scribe. Ques: What details will RRB ALP Admit Card 2018 for SC/ST candidates carry? Ans: SC/ST candidates who have uploaded the details of their community certificate for availing the benefit of free travel authority (Sleeper Class Railway Pass), RRB ALP admit card contains the details of travel. Such candidates will be allowed to book tickets only on submission of the self-attested copy of admit card. They should carry the documents like original SC/ST certificate and one original prescribed proof of identity. RRB ALP 2018 Exam – How to Prepare for Second Stage CBT? According to RRB ALP exam pattern, the second stage CBT consists of two parts – A and B. Part A of the second stage CBT will have questions from Mathematics, General Intelligence and Reasoning, Basic Science and Engineering and General Awareness. Part B will contain relevant trade-related questions. Candidates can follow few tips to prepare for RRB ALP second stage CBT. First and foremost step of preparation is to understand the exam pattern and syllabus. Attempt mock test regularly to increase speed and efficiency. Your RRB ALP & Technician brochure has been successfully mailed to your registered email id .